Walk with ChaMike around Merlion Park, Esplanade & Marina Bay Sands. 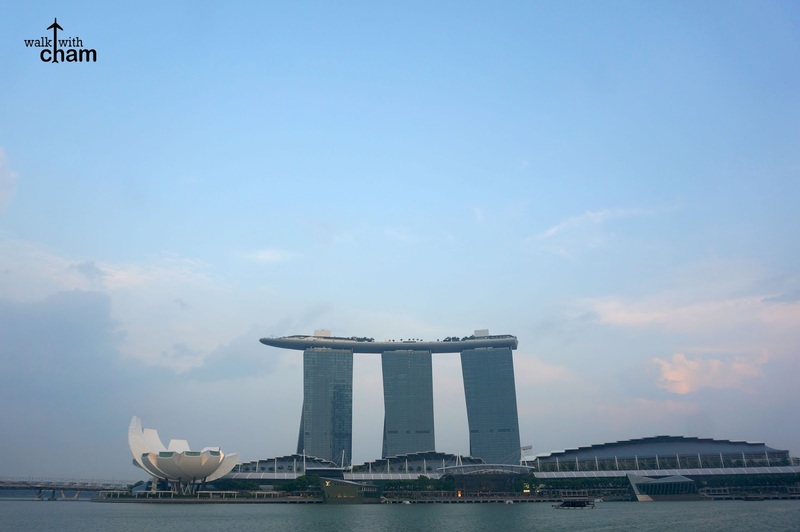 The most iconic landmarks of Singapore can be seen along the waterfront of Singapore river- Merlion, Esplanade and Marina Bay Sands. 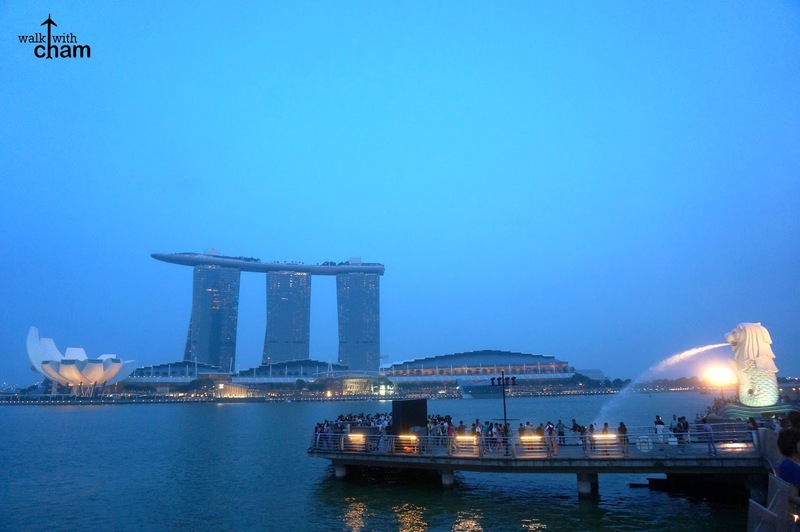 These attractions are the most well-known in Singapore and can be visited just by walking around. Mike and I started the walk at around 5pm from Merlion Park then straight to Esplanade passed by Helix Bridge then ended it at The Shoppes at Marina Bay Sands where we had our dinner. After getting out of Raffles Place MRT we walked towards Merlion Park and saw a famous sweet treat along the street. A red pushcart with a heart logo similar to our Selecta caught Mike and I's attention. It was Wall's ice cream trolley so Mike and I got really excited (we heard of the ice cream sandwich before, I wasn't able to try it the last time I was here) we immediately ordered 2 ice cream sandwiches after asking how much the price was. 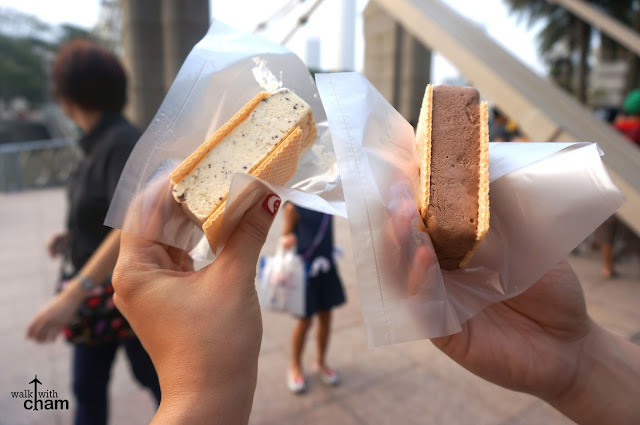 The S$2 (P70) ice cream has various flavors but because I wanted a regular flavored ice cream I ordered cookies and cream while Mike chose chocolate, they also have 2 types of sandwiches to choose from - either a slice of bread or thin wafers, both of us chose the latter. 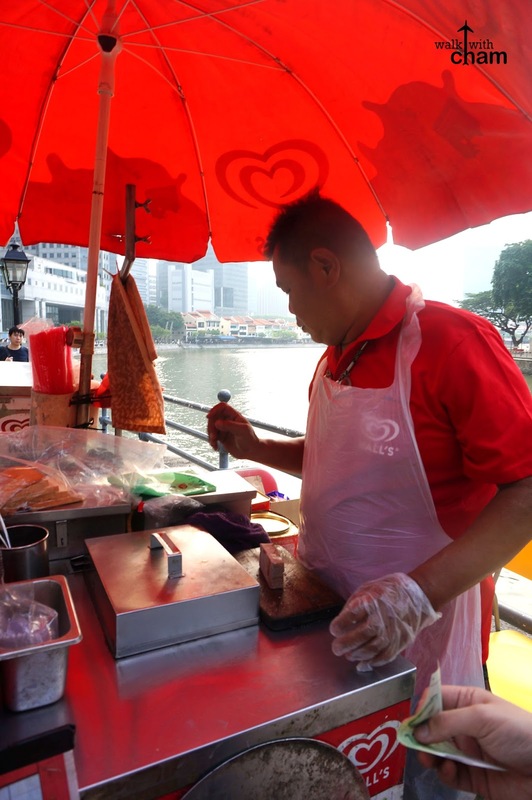 While the vendor was preparing our orders, another tourist approached him and asked how much the sandwich was. The vendor rudely answered "haven't you heard what I said?!" We both got stunned and I told Mike "Masungit si manong" (The vendor is grumpy). Suddenly the vendor asked us if we're Filipinos and we skeptically said yes (I suddenly thought maybe he's Pinoy and understood what I just said but refused the idea as he has a strong Singlish accent so he was definitely not Pinoy) then he swiftly shifted his mood and started opening up - he worked in the Philippines for a couple of years and loved the experience. He ended the talk by giving us our orders plus a durian candy as a treat then graciously said thank you. Wow! It is always a nice feeling bumping into a foreigner who appreciates our country. Thanks, Mr Vendor for the very kind gesture despite being grumpy to other costumers. 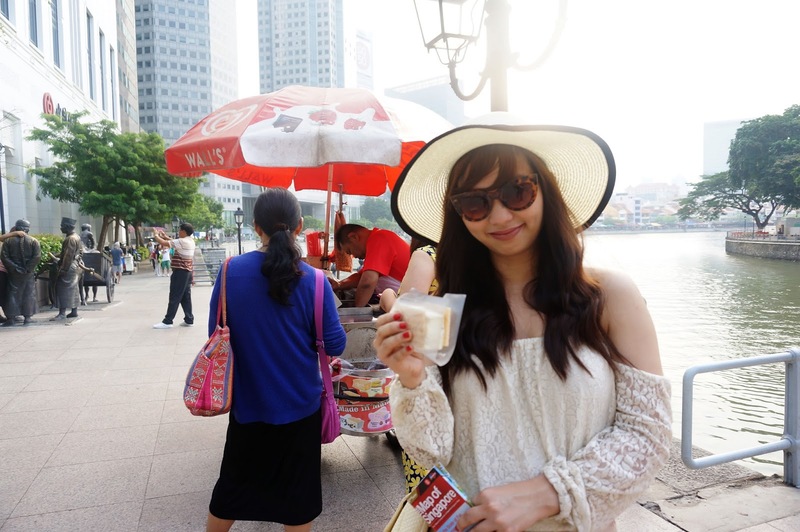 Going back to our ice cream wafer sandwiches- oh, it was indeed yummy! 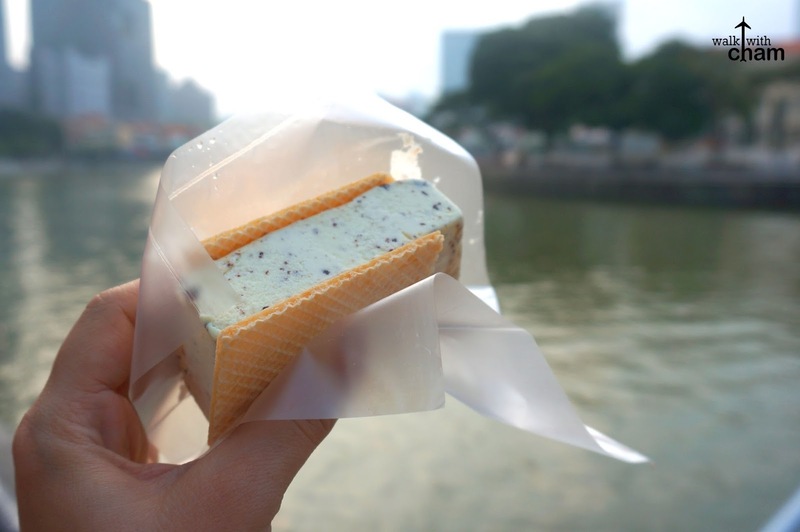 the silky texture and the sweet creamy flavor of the ice cream compliments really well with the wafer, a perfect snack on a hot day in SG. 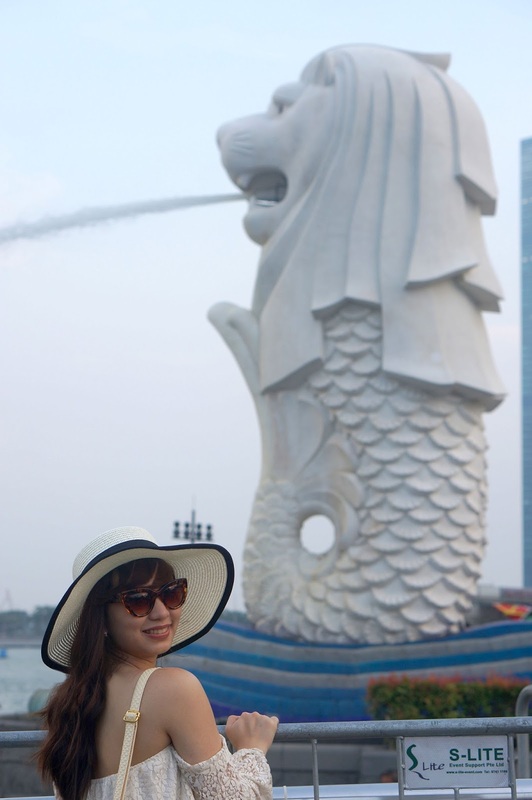 While finishing our ice creams we continued our walk toward the park and finally reached Merlion. 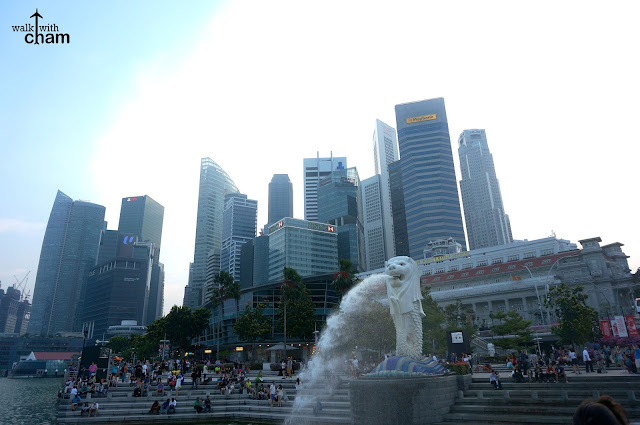 As what the locals say, you've never really been to Singapore if you haven't visited the Merlion. Last time I was here, I was so 'lucky' that the Merlion was under renovation. 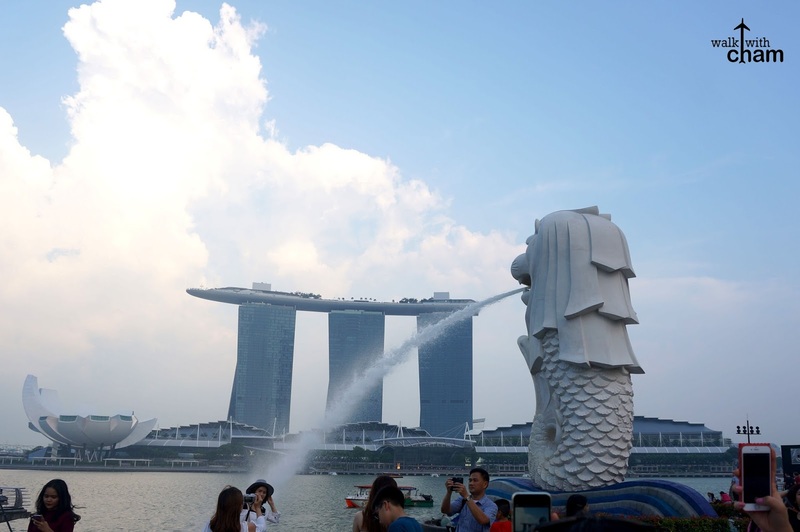 So yes, I think I haven't entirely visited Singapore before so good thing that when we go there the Merlion stands there in its glorious figure spouting water in its mouth. 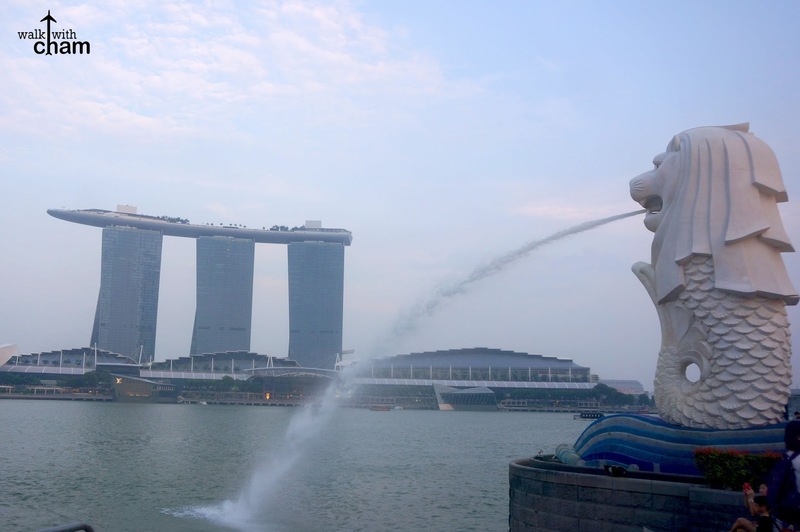 From the Merlion Park you can see the majestic Marina Bay Sands, it is dubbed as the most spectacular hotel and casino in Singapore making it one of the most expensive hotels in the city. Mike & I planned on staying at least one night there but unfortunately the plan didn't push through. Mike assured me though that someday we will have our dream staycation in one of the rooms and lounge in the highest infinity pool in the world. 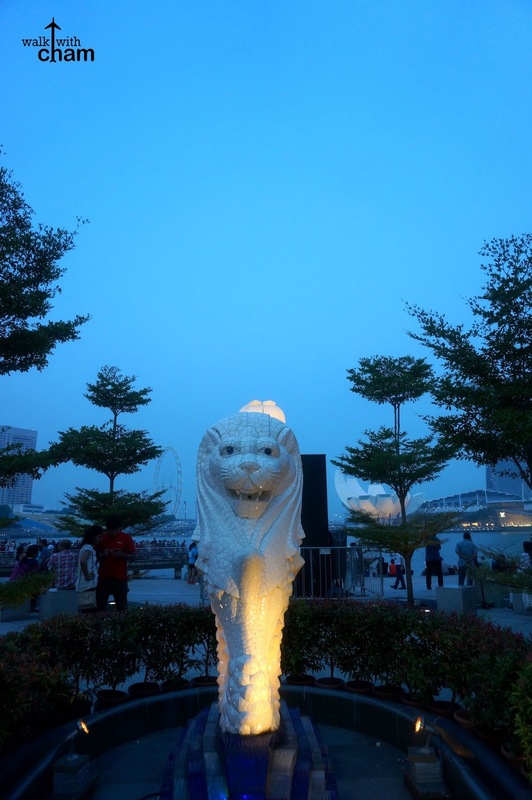 Because the Merlion Park is a known tourist attraction expect a heavy crowd scattered all over the place. It was a sure challenge taking photos. Wore a decent outfit for our dinner at Bread Street Kitchen. Off shoulder top and khaki pants did the trick. 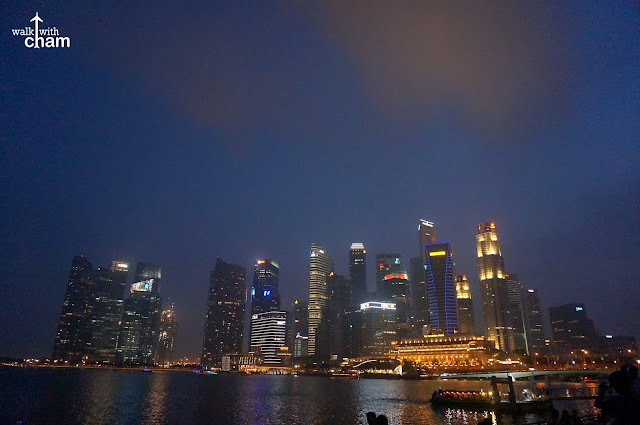 At daybreak Mike and I decided to resume our walking adventure going to Marina Bay Sands by passing through Esplanade. 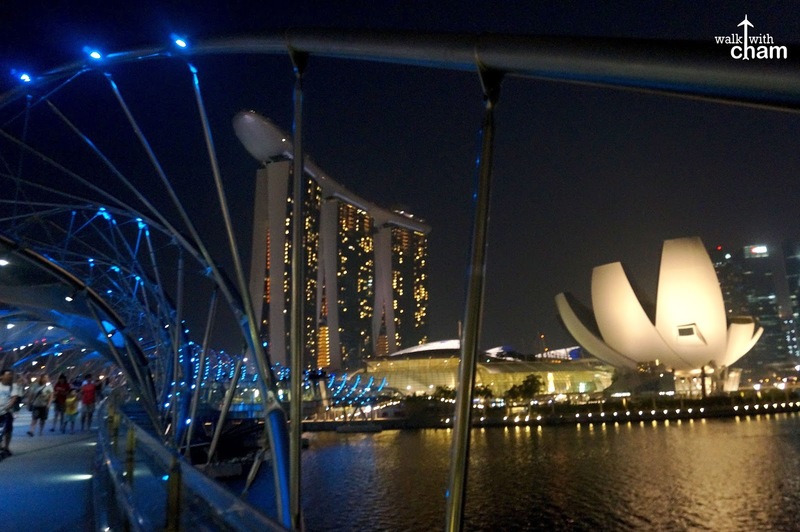 Another waterfront attraction is the Esplanade Theatres on the Bay. 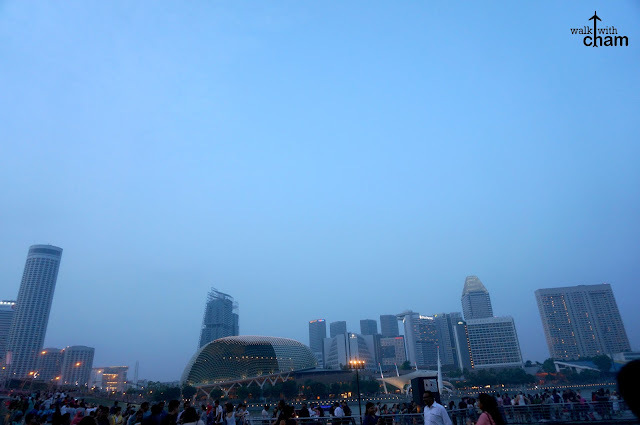 A performing arts centre showcasing various shows from music and dance to theatre. 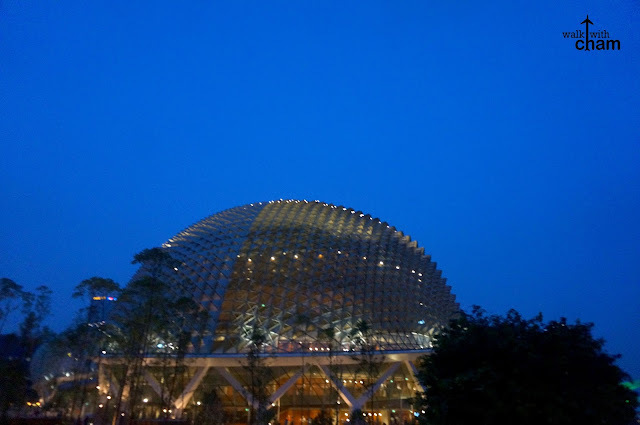 The unique 'Durian' shaped theatre has become a giant cultural landmark in Singapore. 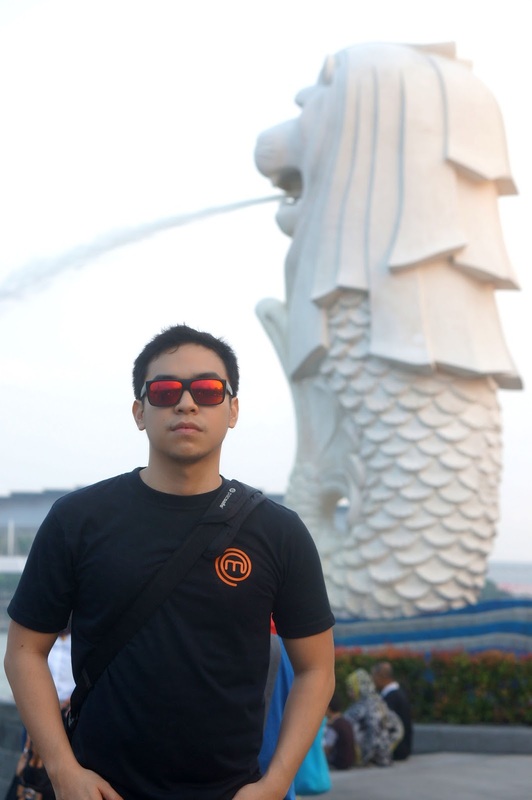 I visited Esplanade last time I was here so Mike and I just passed by it. You can check out schedule of shows at www.esplanade.com, they offer free programs regularly at various locations around Esplanade too. As we walked further we passed by Marina Bay Street Circuit. 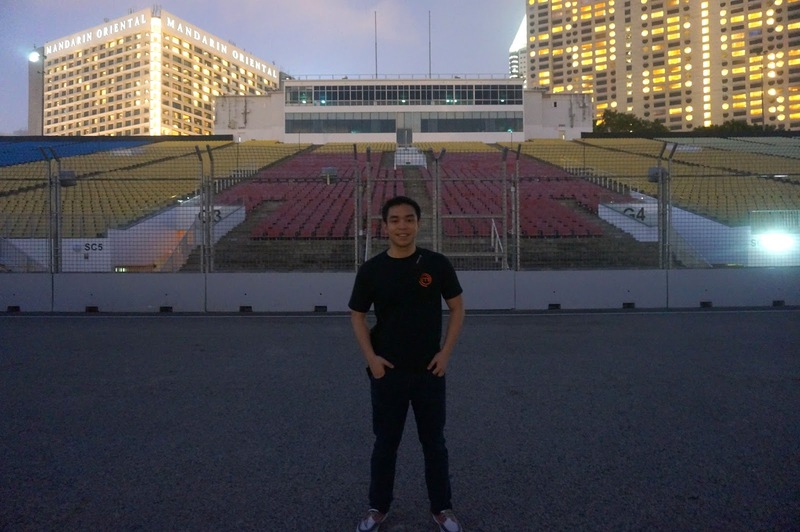 We were here just weeks ahead of the scheduled Singapore Grand Prix event but still when Mike saw the paddock his face totally lit up, he was in awe. Too bad the area was so dark that I had to take numerous shots just to make one clear photo of him. 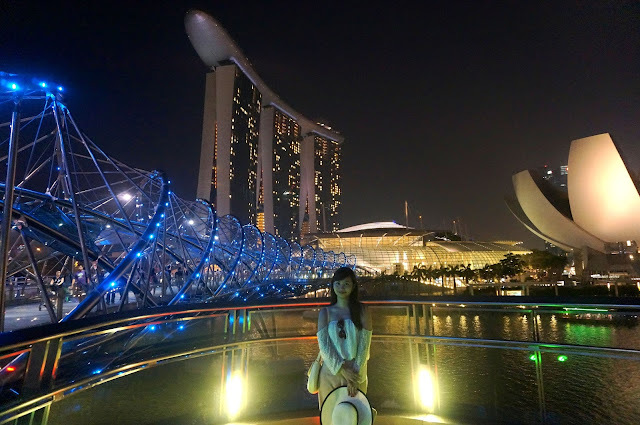 A pedestrian bridge that connects you from Marina Centre to Marina South in Marina Bay area. 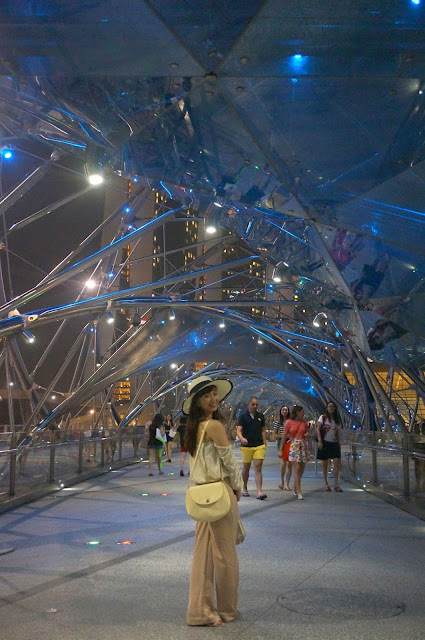 This DNA-like bridge is illuminated at night by a series of lights hence the reason why I wanted to walk here during night time, it gives its visitors a visual experience while strolling. The bridge also has 4 viewing platforms strategically located at areas that offer beautiful views of Singapore's cityscape. So I never thought it would be a long walk. 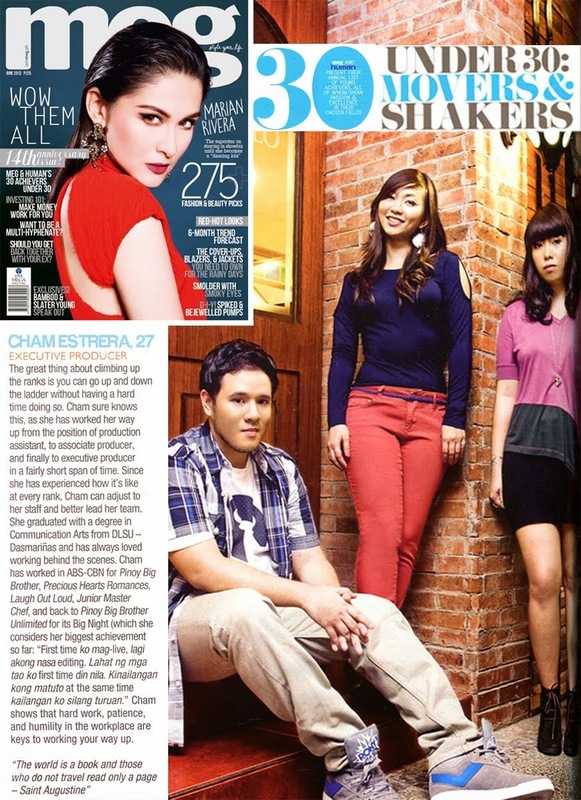 First time to walk on heels! 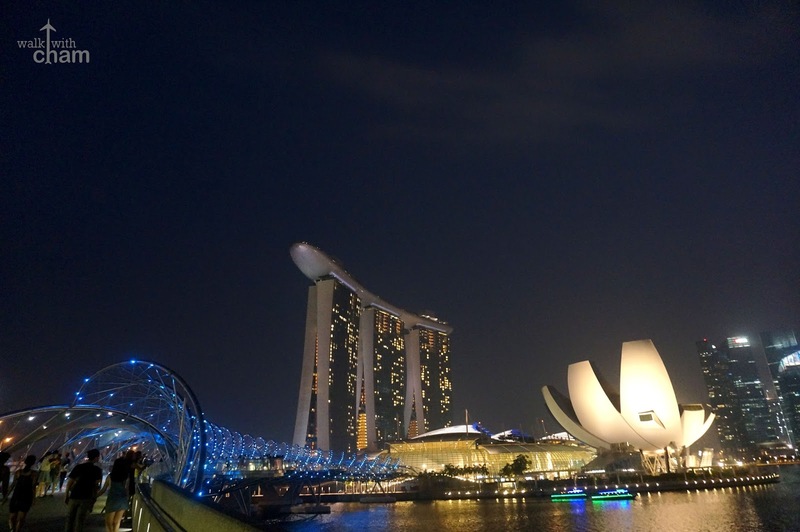 The endpoint of the bridge is The Shoppes at Marina Bay Sands. The Shoppes is a luxury shopping mall that house all high-end brands and restaurants. We ended our walk by having dinner at a popular celebrity chef restaurant, Bread Street Kitchen by Gordon Ramsay. 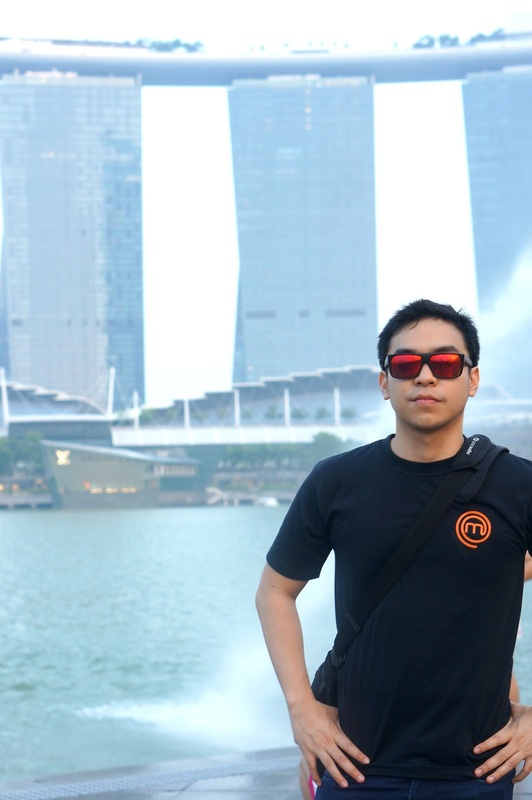 You can also opt to have dinner at DC Superheroes Cafe if you're coming from Helix Bridge as its just one floor lower. 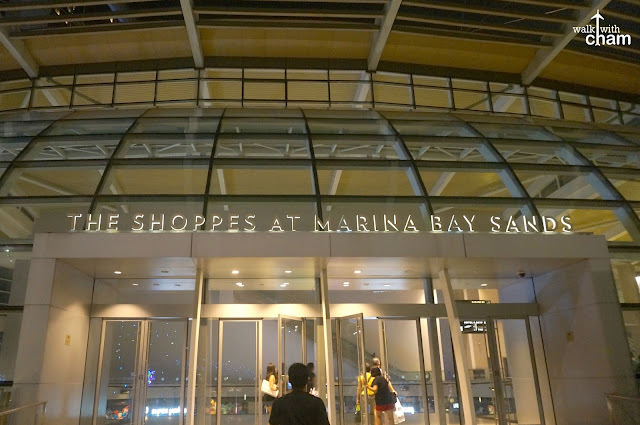 We went back to our hotel via Bayfront MRT (yellow line) located at the ground floor of the mall. 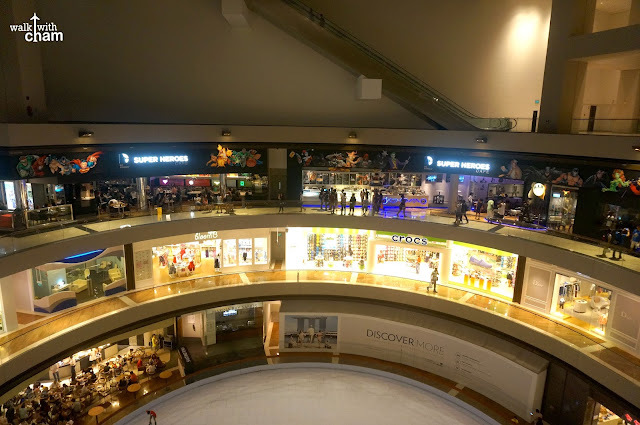 It stops directly at Dhoby Ghaut MRT Station. 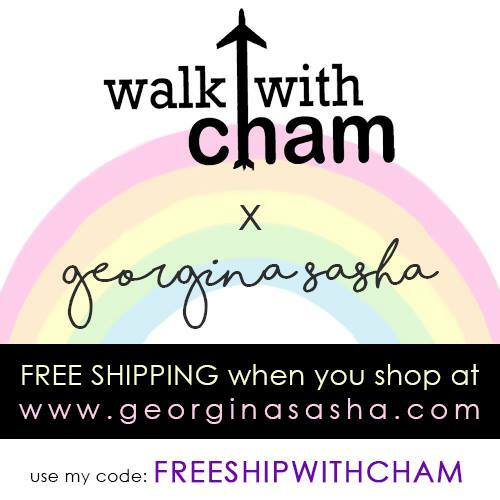 Just a reminder when doing the same route as ours be prepared to walk A LOT! 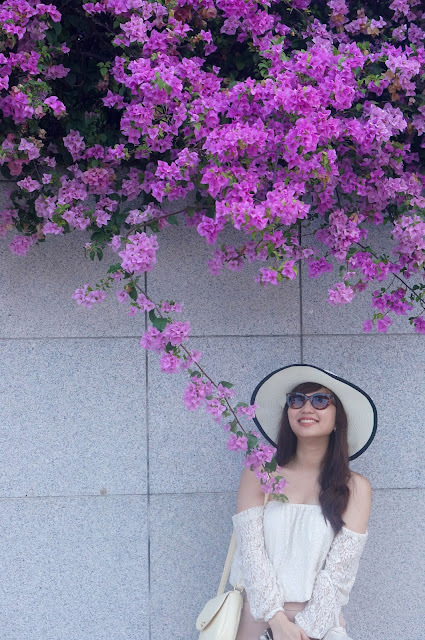 I realized I wore the wrong shoes (in 1 1/2 inch heels) but nonetheless strolling along pleasant sights was worth all the feet ache.